Although sales are not naturally my strong point, I picked up a few tips while working in retail. I’m not one for pushy sales tactics but you also don’t want to hear crickets when people are at your booth. Part of the beauty when you sell handmade products is the experience the shopper gets with the creator. When do you ever get to talk to the person who designed the clothes while shopping at Gap? There’s a personal connection you just can’t beat. 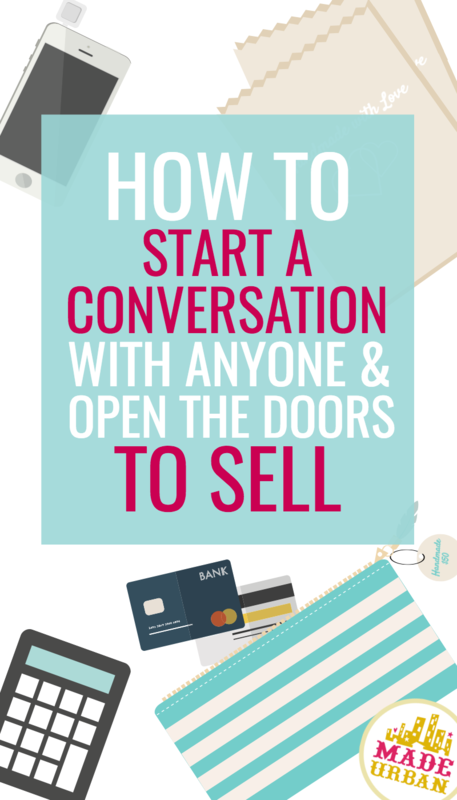 Before you can sell to someone, you must start a conversation. 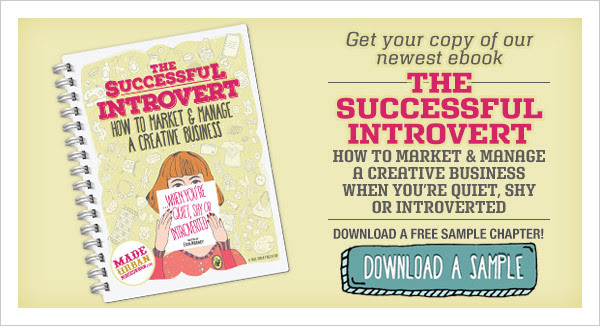 You can’t just jump into a sales pitch or you run the risk of driving craft show shoppers away. The conversation needs to feel natural for both people; the buyer and the seller and start to build that connection. If you weren’t born with the gift of the gab, here’s one easy tip that will get any convo started to open the doors to sell. A close-ended question is one they can answer “yes” or “no” to. An open-ended question typically starts with who, what, where, when, why or how and is one the customer can’t answer “yes” or “no” to. The biggest key to turning shoppers into customers is to engage with them and make them feel comfortable. If you feel awkward and uncomfortable, they’ll feel the same. And how often do we like to stick around when the vibe is off? People are more likely to engage with you and take their time at your craft show table if you can keep things casual and comfortable. People are also more likely to buy if they feel a connection with you and you build a connection by starting a conversation and discovering some common ground. Let’s be honest, nobody needs another pair of earrings. They’re going to buy another pair if they like your product and they feel a sense of connection; whether that’s because they love the artist behind them, the fact that you use recycled materials or that each sale supports a cause. Engaging also allows you to dig deeper and find out how you might be able to address their needs. If you ask them a close-ended question right out of the gate, it can easily stop the conversation right then and there, effectively closing the doors on you telling them more about your handmade products. Imagine you’re working at a store in the mall and your job is to show customers all the great items and deals around the store. If your first question is: “Can I help you find anything today?” and they say “no”, it would seem a little silly for you to then try to help them. If however you ask them: “What can I help you find today?” they’re forced to give you a few more details. Even if their answer is “nothing, just browsing”, it still gives you an opening to let them know about the deals to take note of while they’re browsing. Shoppers at a retail store are a little different than shoppers at a craft show. Most go into a store with an intended purpose while craft show shoppers have come to see a wide variety of artists without knowing exactly what they sell. With this in mind, you can start with open-ended questions that are on general topics as opposed to more specific “what can I help you find” type questions. That way you won’t come across as pushy or make them feel like you’re only looking to sell to them. The quickest way to send shoppers away is coming off too “salesy”. If you need some help in that area (don’t we all? ), the techniques in my-e book will turn even the most awkward salesman/woman into a natural seller. 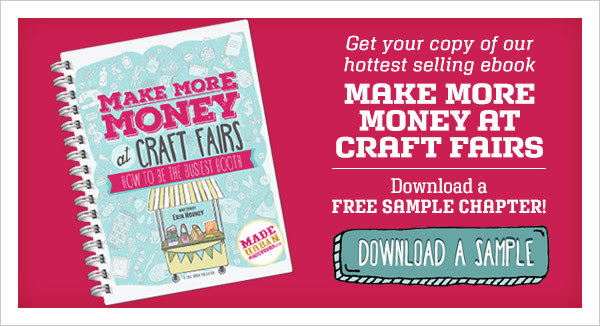 MAKE MORE MONEY AT CRAFT FAIRS goes into more depth on conversation starters with additional ideas and examples, selling tips for introverts (or those uncomfortable with selling), how to share important info through stories so no one feels like they’re being “sold to” and putting all of it together for a powerful craft show selling punch. What brings you to the craft show today? I see you found something at ______ (insert handmade vendor name here), I love their work, what did you get? How did you find the line up this morning? You got a swag bag! What did you get in there? Be sure you’re not firing question after question at them, this isn’t an interview 😉 These are just some ideas to get a conversation started and after that, let it flow and start to sell your handmade product. If the shopper doesn’t seem interested in chatting then just allow them to shop and be around to answer any questions they may have. There are a few close-ended questions that can still work to start a conversation. As long as you have follow up points that lead into more conversation, regardless of what their answer is. If you sell earrings and you ask the close-ended question: “Are you looking for earrings?” and they answer “no”, you’re stuck. But you could ask: “Have you heard of us before?” If they answer “no”, great! 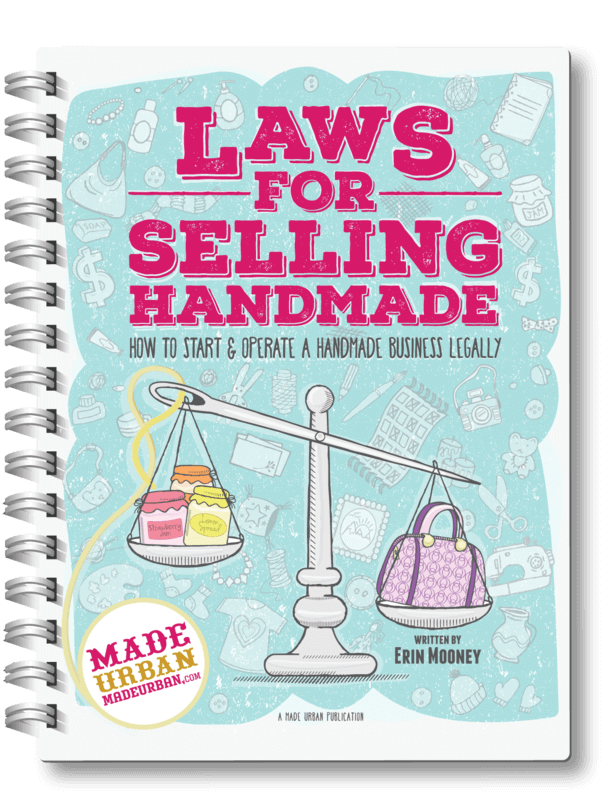 You can share a few important points about your handmade products or business. If they answer “yes” you can ask how they found you or which products they’ve tried. Again, you don’t want to overwhelm your shoppers with information overload. It really is important to uncover the important facts your ideal customers are going to care about and share them in an interesting way. Don’t force people to stand at your table for 10 minutes while you share your business’ entire background. Keep it simple and above all, fun! 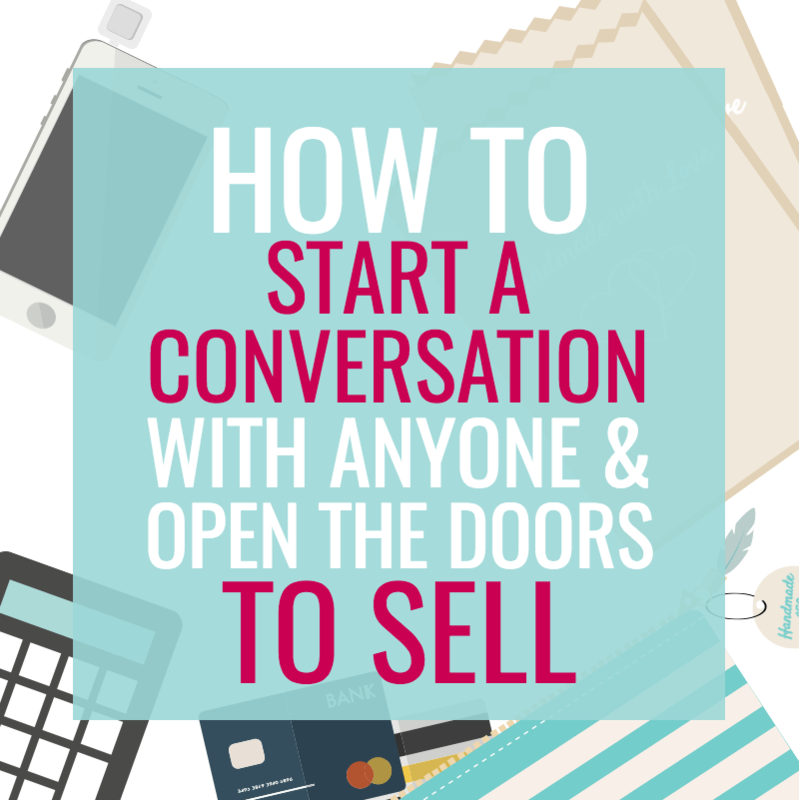 Once you get a conversation going, it’s so much easier to sell. If you need guidance when it comes to a your sales pitch, MAKE MORE MONEY AT CRAFT FAIRS will walk you through each step of selling. You’ll discover how to make selling more comfortable for you, how to uncover the information your shoppers will actually be interested in and how to bundle it into the smoothest, I’m-selling-to-you-but-it-doesn’t-feel-like-I-am sales pitch. What are your favorite open or close ended questions to use at a craft fair? This was so helpful! I was searching for tips to help my new sales team in a retail store start conversation and drive sales without being cookie cutter. I will definitely be using this is a training session! Thank you!! Thanks for reading. I’m glad you found the info useful. The advice is actually how the major retailer I worked for trained their sales associates so I hope it’s just as helpful for your team!